Have you ever got up one morning and thought of going anywhere far away from everything that you are part of and explore yourself on an unknown, unplanned journey to somewhere? Have you felt good about the thought of disappearing away from this chaotic city life and go somewhere more serene? Well if you ask me, I have always had this thought. I wanted to just tread on an unknown path, to a place where I do not know anybody and no one knows me. And this weekend that dream turned into reality. A few weekends of watching television, meeting friends and shopping made me wonder if I had nothing exciting to do out of these two days that I get. This was when I decided on going on this unplanned trip to somewhere. 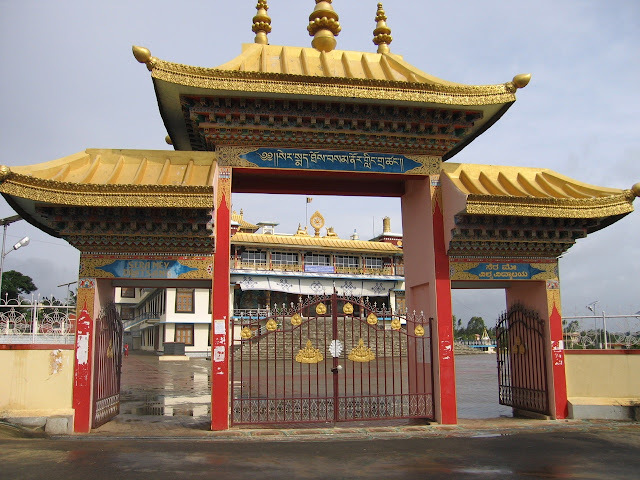 I always wanted to go to Bylekuppe, it’s one of the largest Tibetan settlement in India and here in Karnataka. Yes not in Nepal, Bhutan or any other north eastern part of India, but very much in my own state, Karnataka. Except this and directions to get there, I knew nothing else about this place, and thus it made the trip most exciting and memorable. I got up early, packed my bags and took off to KSRTC Bus stand in Bangalore. Bylekuppe is a small village in Mysore district but only 35 KMs before Madikeri (A famous hill station in Karnataka). So I had to catch a bus to Mysore then another to Madikeri. I quickly boarded the bus to Mysore which I saw first. The conductor told me that I could get down in Hunsur which is on the way to Madikeri and that I would get plenty of buses from there which would lead me to my destination. My journey out of Bangalore began at 6:25 AM. So, I set off on this pleasant journey. When the bus stopped for a while, I loved the music that fluttering leaves made. A big house in middle of corn fields made me wonder if lot of people lived in it and if they owned all the land around it? Where there were road constructions in progress, the detour signs clearly written to guide the vehicles made me happy about the fact that we are following best practices. When our conductor threw some water bottles for the construction workers, their happiness and battle to grab it was a worth watching scene. After all this continuous flow of thoughts I reached Hunsur at 10:50 AM. I quickly boarded another bus to Madikeri and asked the conductor to alert me as the bus reached Bylekuppe. This part of the journey was even more beautiful than the previous. Who said that one should not travel to hill stations during rainy seasons? I think it’s the best time to visit such places especially if you enjoy the rain drops playing with the nature and if one does not mind getting wet in the rain. It was greenery everywhere. I reached Bylekuppe at 12:00PM. Here, I saw a big board welcoming me to the Tibetan camp. I took an auto till Camp 4, directly to the golden temple. As the auto made its way into the settlement, I noticed that this was a totally different world here. There were Tibetans everywhere, monks dressed in maroon robes, Villagers working in the Corn fields. It was like, I was somewhere in Nepal or Bhutan or some Northeastern part of India. As I slowly walked into the Golden temple Premises, mysteries & secrets that it enclosed began to unravel one by one. I guess these pictures will explain better my lack of words to describe the sights. It was truly a mesmerizing view. 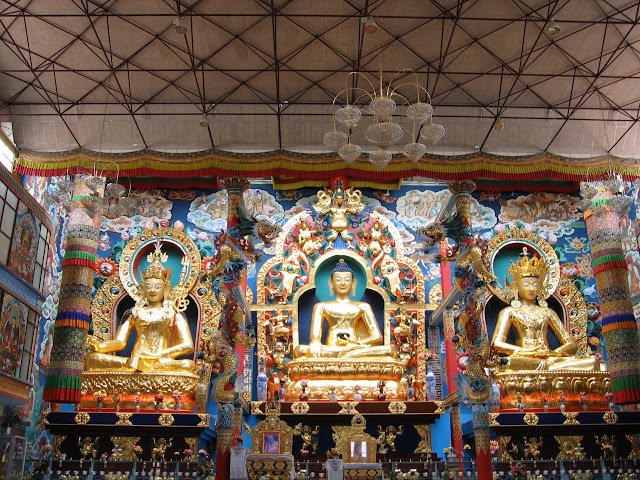 Walls are painted with events from life of Buddha and other Gurus. Monks performing their daily rituals and prayers. On my way found this interesting Monk. I could not understand his Tibetan language and he, mine. But we tried to build some conversation. He wanted me to take pictures of everything. He pointed towards the idols and asked me to click pictures. I spent hours taking pictures of the idol and the monastery and then moved to a guest house in Camp 4. A Monk there spoke good English and much better Hindi. He was basically from Darjeeling. I checked in and decided to take his help in getting some information about the place. Dhava (Not sure how it is spelled, but it sounded like that) drew a map of the settlement and told me how to find different monasteries and camps. He explained to me that they followed Mahayana Buddhism and there were 4 sects among them. - Nima, Geluk, Kagyu and Sakya. (Again spelled as they sounded) and many sub sects within them. The basic difference was in their Gurus and slight variations in method of meditation and prayer. Tibetans have classified the place under different camps. There are about 18 camps, he said. 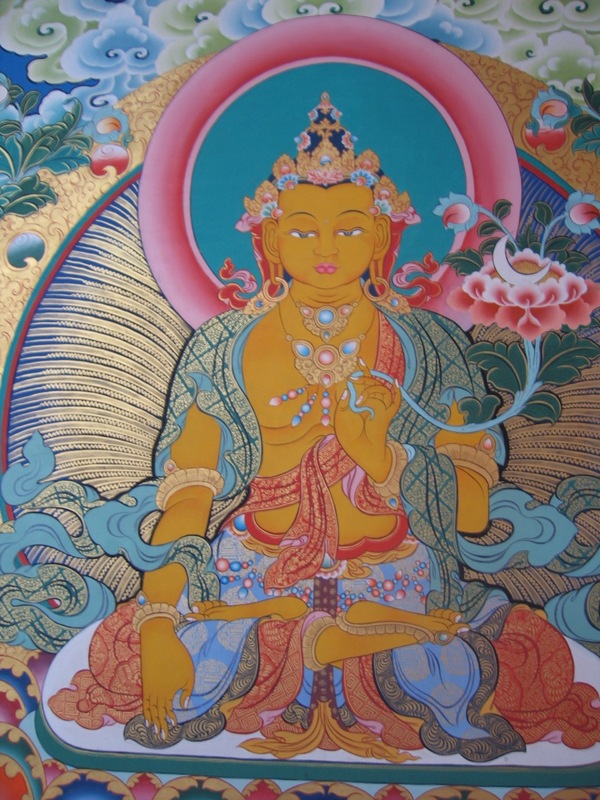 After thanking Dhava for his useful information and details on different Monasteries, I set out on my expedition. 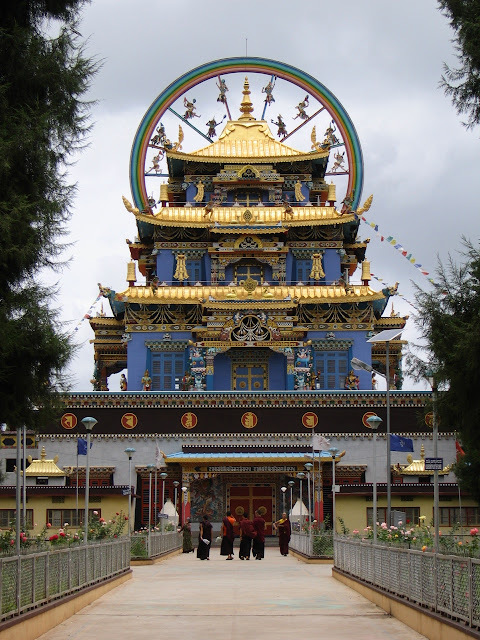 I took an auto to Kagyu monastery which is about 4 kms from camp 4. The view from there was again awesome. The monastery stands on top of a small hill over looking the green corn fields. I could hear the prayers from inside the monastery so I just walked around the place and enjoyed the spectacular view. I decided to walk, to other monasteries as the weather was very pleasant. Just outside the monastery there were 3 stupas. 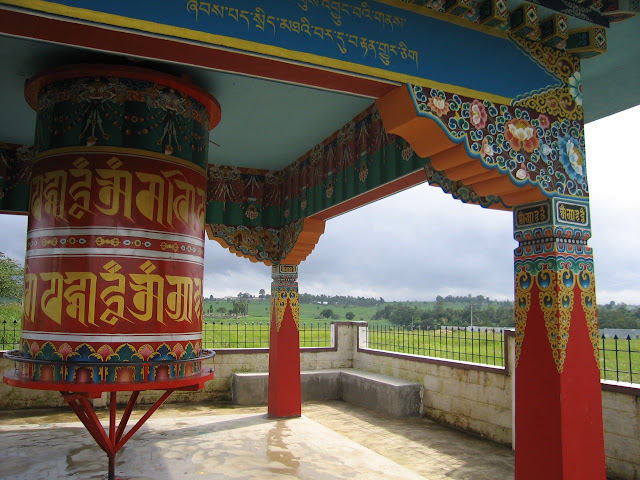 Stupas are Buddhist monuments traditionally containing relic(s) of the Buddha. My decision to walk back was the best one I made because otherwise I would have missed so many beautiful sights. On my way back I tried to uncover the mysteries that this place hid. Here are some of the things that I saw or experienced on my way back. A group of Tibetan villagers with their back packs walking to their homes. A nice prayer hall hidden behind a crowd of trees, filled with Colorful flags. It was difficult for one to distinguish between the leaves and flags. Mesmerizing view of new bigger Kagyu monastery which is under construction. A group of villagers packing freshly removed gingers from field. Cows with ear rings engraved on which were their identification numbers! Children returning back from school. Colorful flags dancing in the wind found everywhere, between the bushes, on trees, in between the fields, on houses. Beautiful wild flowers, Hills covered with mist. Walking through the fields guided by a farmer to reach the Sakya monastery by a short cut route. Exploring Sakya monastery all by myself. There was no one around. Surprised to see a totally different world in there, schools, colleges, hospitals, old age home and what not. An auto driver explaining to me that it was a forest before and the Government donated the land to the refugees from Tibet. A Stupa dedicated to the brave soldiers who have sacrificed their life for the freedom of Tibet. A prayer bell and a painted mask of Goddess Tara which caught my eyes and slipped into my carry bag. Enjoying the tiny drops of rain. Not finding tea in a Tibetan hotel and wondering what kind of a hotel it was. Becoming a reason for Buddhist nuns to laugh at one of them when I asked her if the monastery was closed. Walking back to the golden temple and enjoying the dim lighting showering more grace on the 3 main idols. Silently sitting there and observing the statues and trying to arrive at an explanation for the expressions carved on their faces. Behind the monastery watched little kids playing soccer. Its Soccer time! "Ban Chinese goods" banners indicated the heat was on, even miles away from home. Got up early and went to the temple again. Returned back, got ready and took an auto to Lama Camp. The auto driver Farooq was keen on knowing about Bangalore and he mentioned that his friends work there and had visited them once. Lama Camp has two main categories, Serjey and Sermey. Sermey temple has a big prayer hall at end of which are many statues of their Gurus. But one interesting thing to see was thousands of very little brass Buddha idols that filled most of two walls of main prayer area. Amazing piece of art that covered rest of the walls. I got to speak to a monk who is originally from Tibet and has moved to India in 1992. He said that he liked living here in Karnataka and that this is a beautiful place. When asked about Tibet, he said that he can not go there as he did not have a passport. And of course, the continuous fight for freedom that prevents his travel. He wanted to know more about Bangalore and told me that he once visited the city for 3 days. I told him that Bangalore is crowded with people, buildings and vehicles and that was why I was here for a change. I then walked into the library and a book shop. At the book shop I heard a nice Tibetan music that the monks were busy listening to. I requested them to give me a copy of it. They told me that they did not have the original but could give me the CD that they had burned. I was more than happy to accept it. Also bought 3 books - Folk tales from Tibet, An anthology of Tibetan poetry and Autobiography of the Dalai Lama of Tibet. I then walked through the narrow streets of Lama Camp where chanting of mantras from every house filled my ears. As the school bell rang, many monks went running into the campus with their books. I could not go into the Serjey University as it is under renovation. I then walked to a restaurant called, Siddhartha where I had a Tibetan food called “Blanket”. It tasted more like buns or bread. More like Mangalore buns. It tasted good. I returned back to the hotel, checked out and then had a last visit to the Golden temple. 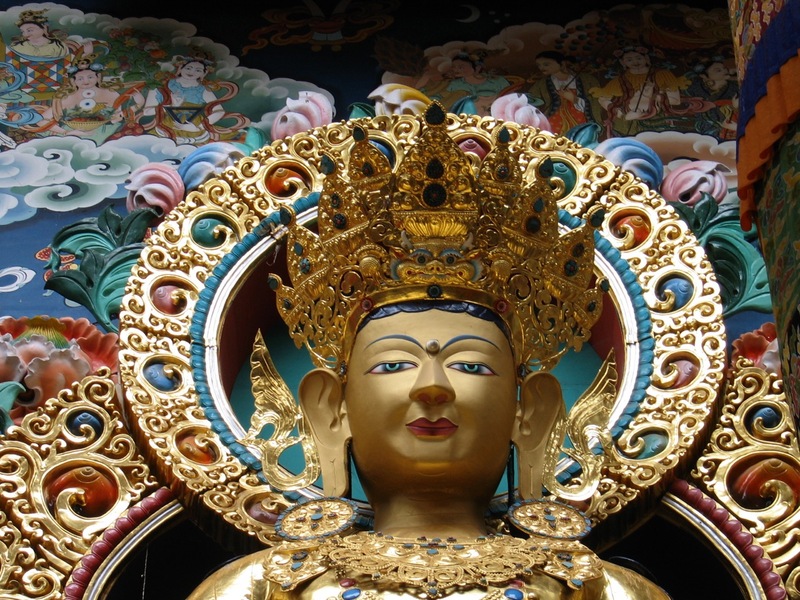 I then took an auto to the last monastery on my list- Tashi Lompo. Where I found this little boy amused by my digital camera that showed pictures soon after the click. The care taker of the place was kind enough to open the monastery for me. He is from Ladakh and told that he left his home in 1983. His parents and brothers still lived there and he only talked to them over phone. They want him to return but he likes this place better. “Its very cold there” he says to give a very simple reason. Thousands of questions were waiting to be asked. I wanted to know more about their life, more about their culture but I kept them behind the perforated wall in my mind. I dint want them to be offended by any of my questions. Because they were so nice to me, in fact to anyone for that matter. They would not object you walking anywhere in their settlement. This monk also gave me detailed time table of their daily routine which was interesting to listen. 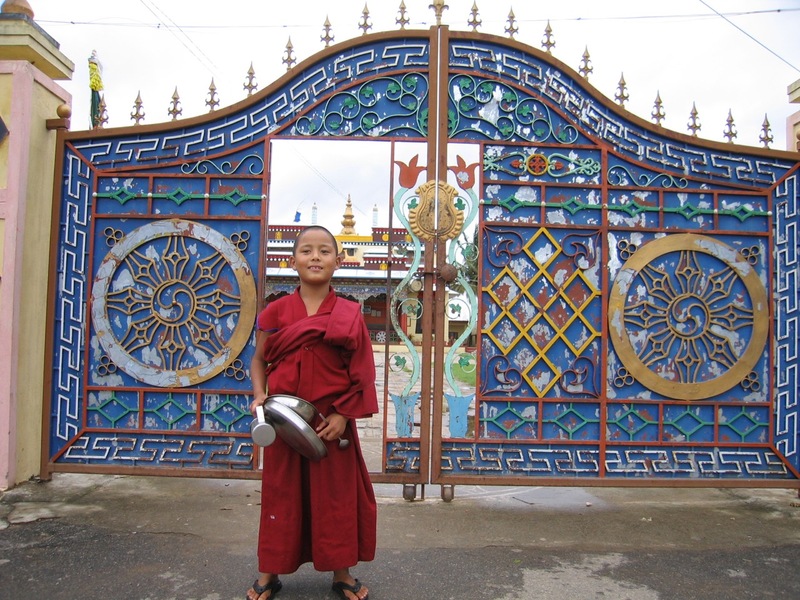 I thanked the Monk and walked out of the gates of monastery and out of the settlement. I boarded a bus to Mysore and on my way everything flashed back again. I was taking back faces, events, places, moments, sights and stories. Today, I am returning back home with something I did not know yesterday. And I happily enjoyed the rest of the journey with beautiful images flashing back and forth in my mind. I took a train back to Bangalore. The train was over crowded. The entire train journey qualifies to become another post in this blog. Will keep that reserved for later. This chaotic journey back made me realize that the serene and peaceful weekend was over. But as a traveler, I convinced myself by saying - Enjoying every possible journey is a traveler’s nature. But this experience has made me a much better human being than I was before. I have learnt many things, enjoyed many moments and known many more things and most important of all, I know myself a little more better today, than what I knew yesterday. Ajey, do not forget about the list for our North India expedition. I am working on it already!! Sure! I have worked on many travel plans already :-))) Dont know when will I get time to turn all that into reality. Will keep you informed. Your post was informative, and so were your pictures. Wonderful post. Have you been to Leh? You will definitely enjoy it. Journeys all by yourself do that to you.. and believe me, it takes more than guts to do any journey all alone.. I have often thought about this, but the sheer fact that girls are not allowed to travel alone didnt let me do my own adventure. And waiting for that train-experiences wala post.. Write that up! Tourists who visit this place only go to the Golden temple because there are plenty of other places to see in this district. Let me know when you decide to go there. I can update you on many more tourist attraction near by. It’s not like in the west where you could just travel anywhere all by yourself. Probably, a year’s stay in America has changed me drastically. Few years back, even I would not have dared to go somewhere all by myself. The Train Journey was hilarious. That’s going to be my next post! nice post and yes nice pics! but frankly, the posts tooo lengthy! i'll have to come back to complete it! Thanks..Yes I know its toooooo Long. :-) Well I normally hate having longer posts but wanted this to be in one go. Great read! I agree with Ketki that its a bit long..but I know some posts need all the info. I have some really long posts on my blog too. Wonderful pics too! Got here via desipundit. 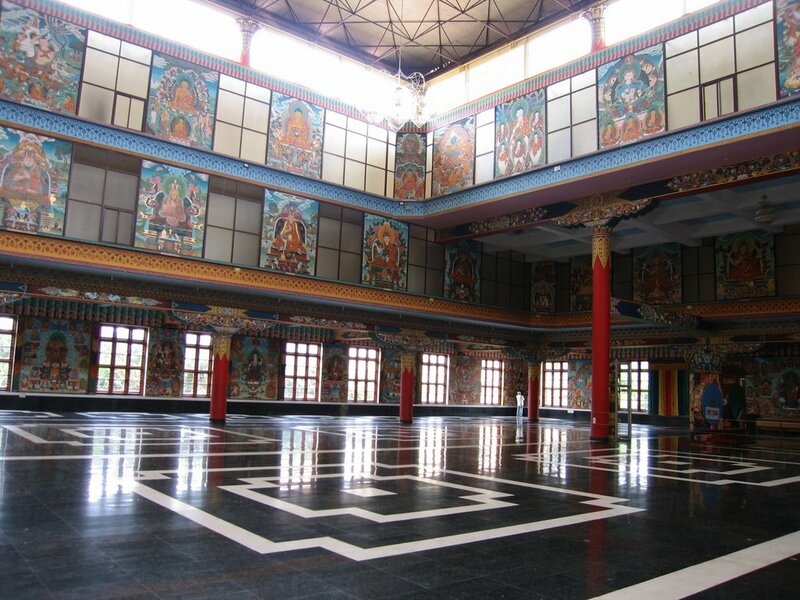 This brought back memories - we visited Bylekuppe when in college. I visited Dharamshala recently, and the two are so dofferent from each other... 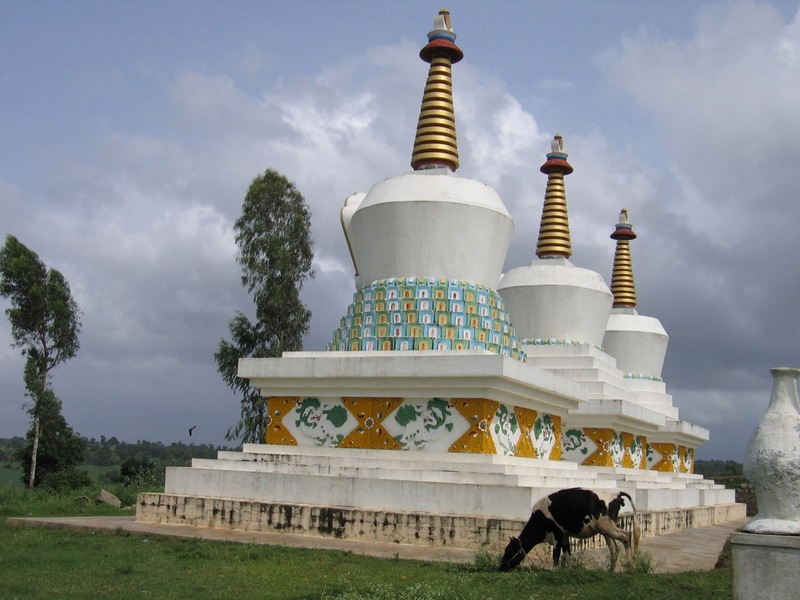 But the best part of our trip to Bylekuppe was talking to the people about the struggle to free Tibet. Anyway, thanks for reminding me! @ Travel Plaza - Thanks. Will visit your blog. @ Erimentha - Thanks for sharing your memories of the place. Yes did get to speak to some monks about the struggle as well which is very sad.Its not easy to be forcibly move out of your own country. It feels good to see people who know about us Tibetans. Was a good read. I just wanted to make something clear. You have written that the Mahayana Buddhism has '4 castes'. Calling it '4 sects' is more proper. may i also ask - what camera? Ajeya, This comment is actually about your USA experience blog. Hope you don't mind that I'm commenting here about it.I enjoyed reading it very much. Actually I only read the first 2 articles, but will definitely be back to read the rest. Even though they are dated back a couple of years, great interesting read. I think you have touched upon the experience of every Indian in US for the first time. Wonderful! So sorry for such a long comment. @ dazedandconfused - Thats great, Thanks. @ Tenzin & Aqua - Thanku very much for the correction. Will change that. @ Anony - Thanks. Its canon S60. @ Travel Plaza - No problem. I have not updated that blog for a long time now. It only has posts from first 3 months of my stay there. There are plenty of things to write about my years stay in US. Will definetly publish them on this blog sometime. Excellent info Ajey.. I have always wanted to visit Tibet and I have been reading a lot about Tibet ..
Thats when I heard about Bylekuppe.. Was doing a google search on it.. and finally found ur blog.. excellent piece of info..
Good thing i googled Bylekuppe and found your blog. I love the colors of Tibet- the reds, blues and gold... Hoping to visit this amazing place pretty soon. 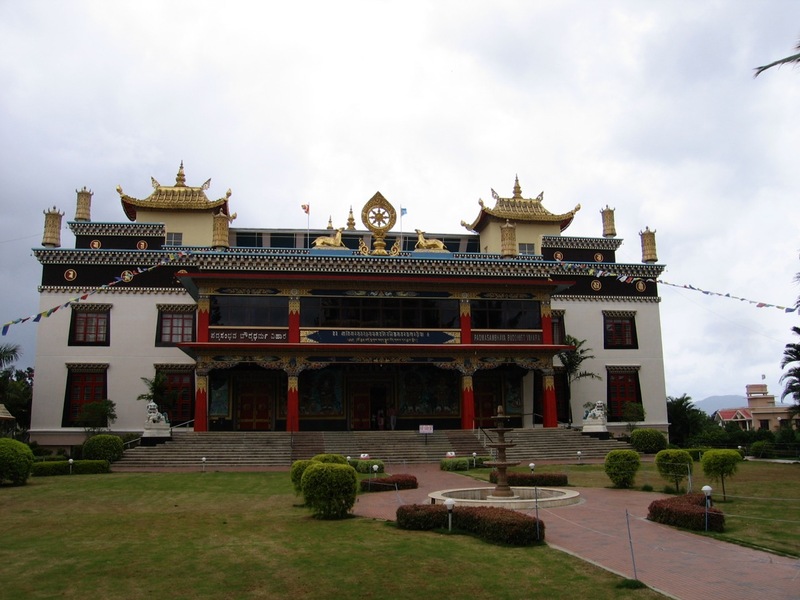 Where we can stay while we go for such a visit in Bylekuppe? Great post and I thoroughly enjoyed reading it. I'm thinking of doing a trip in December. Would be great to get some references for places to stay etc. Can you please email me at shamnad@gmail.com and we could continue conversation? Thanks so much. My first time here......excellent pictures. Will come back for more. Had been there recently on my bike, truly a marvelous place ! !